Venn Projects, the newly launched space at Blackpool’s FY Creatives, hosts the latest iteration of Alice Bradshaw‘s Rubbish project, with the show Museum of Contemporary Rubbish. Everyday discarded items are the focus of Bradshaw’s work; with a projected film of still images, and a series of photographic prints dominating the space. Rather than employing the aesthetics of the museum or collection (as other artists working in this area have done), the subjects are cleanly and clinically presented to us. The rubbish as an object has been removed from the space, leaving only its depiction, the brightly lit photographic representations, garish and in crumpled. This removal allows rubbish to become the subject rather than material of the study. As an audience we are left to consider where these remnants are now – were they allowed to become again the discarded items they once were, or has their new found status resulted in a shift? The photographs show items collected in Blackpool in the lead up to this exhibition, the familiar detritus of any British town: coffee cups, carrier bags, sandwich packets. A pattern of behavior which is reflected in the film and it’s international collections of waste. Both elements of the exhibition repeat images, reflecting the mass and ubiquitous nature of the rubbish. As the film speeds by it is difficult to focus on any particular item in detail, they chase one another at a stuttering pace. We are allowed glimpses – a flash of colour or recognition, some other language advertising the familiar in a fresh context. The collection is encountered here as it might be in reality, a brief glance that barely registers, mounting and replicating. The Museum of Contemporary Rubbish continues a tradition of celebrating and reversing the status of low culture objects within the ‘high status’ gallery space. Bradshaw reflects on this connection between rubbish and contemporary artistic practice in the Rubbish newspaper which is given away to visitors at the show. A large body of research is disseminated and contextualised in this throwaway (often unwanted) medium of the free newspaper. The subject of rubbish is broken down into its taxonomic elements (eg detritus, rejects, litter), these sub-categories become collections in themselves, of theories and works that have now been transformed through the disposable nature of the newspaper as medium. The paper communicates this research in a way which reflects on the content: through quotations, references and Bradshaw’s charmingly simplistic renderings of the artworks she cites, each section is made up of remains. Here, Bradshaw has linked a review of discarded waste with contemporary practice, and, even further, she adapts Walter Benjamin’s method in the paper made up of quotations, and an exhibition consisting of elements found whilst wandering the urban space. Connecting the writer’s earlier comparison of the poet and rag picker, here the artist becomes the collector and hoarder of waste. 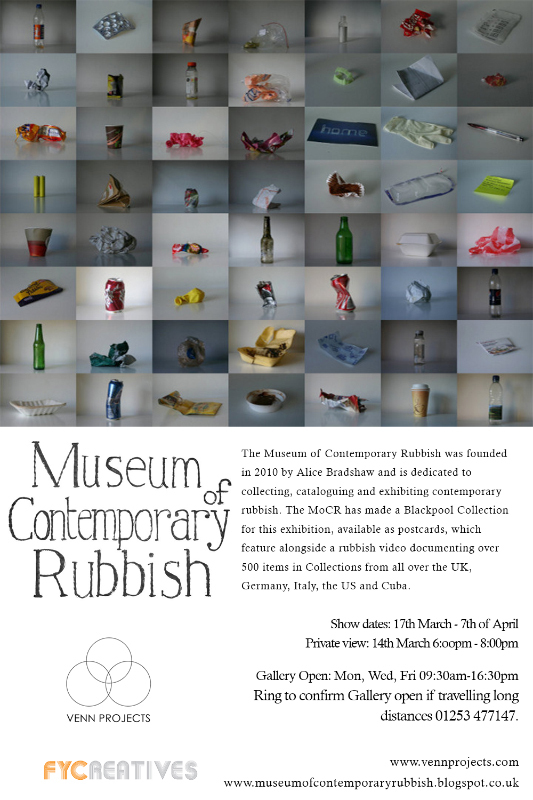 Museum of Contemporary Rubbish continues at Venn Projects, FY Creatives, Blackpool until 7 April 2014. Hannah Elizabeth Allan is an artist and writer based in Lancashire. Current PhD candidate at Manchester Metropolitan University.